← World Champion SF Giants! 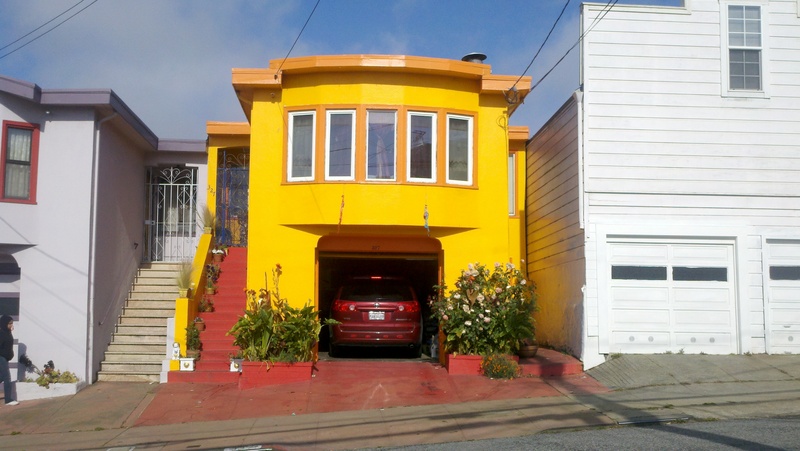 In Mexico you’ll find houses painted brilliant, bold colors like some of the houses here in San Francisco. I’m attracted to them for a couple of reasons. Firstly, I admire the fearless attitude by which the owners strike a note that rings out from the chorus of standard pastel shades that dominate the City. Secondly, I really like bold colors and third, bold colors have a way of pushing my imagination in a new directions. 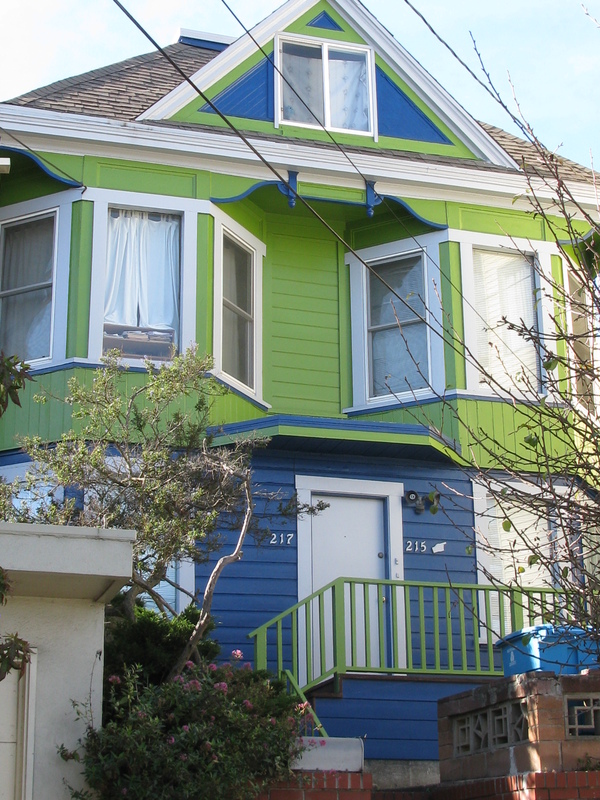 Whenever I come across a house painted bright yellow or bright orange it forces me to re-evaluate my ideas of what I like and what I think I like when it comes to exterior paint choices. 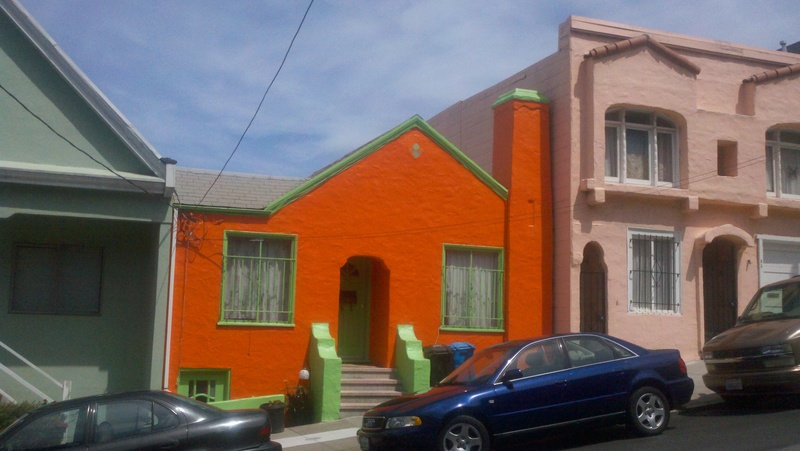 At first glance, these colors may seem garrish or ugly, and sometimes they are but most of the time, it’s me and my concrete opinions that are the problem because the longer I look at them, these bold houses are, in fact, rather exciting and fun to look at. Like a healthy pinch of cayenne pepper in a bowl of broth, bold colors force me to consider bigger possibilities when think of paint choices. And that change in attitude can be very helpful when one is faced with the prospect of painting their home. 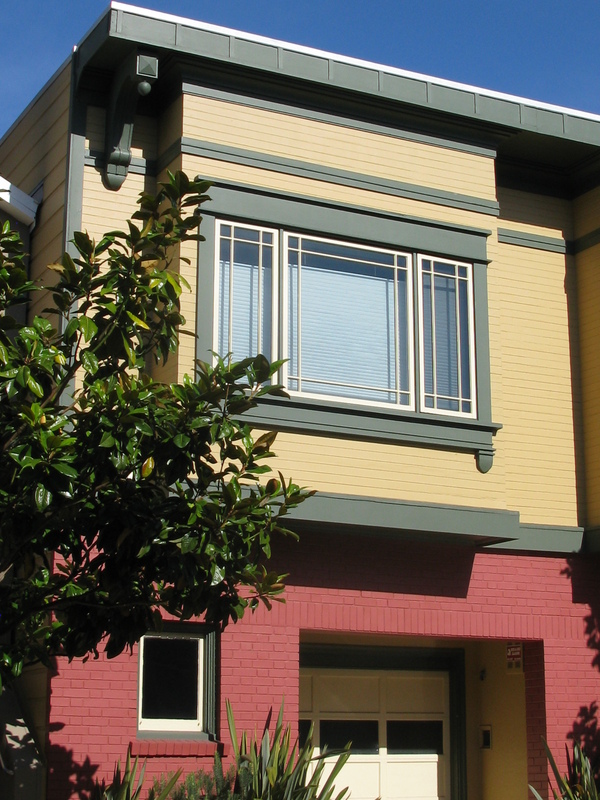 Updating the look of your house can be a scary and daunting task. There are so my color options out there, where do you begin? Do you start with what the neighbors think and choose three (not two) colors that are similar to what everyone else has chosen? 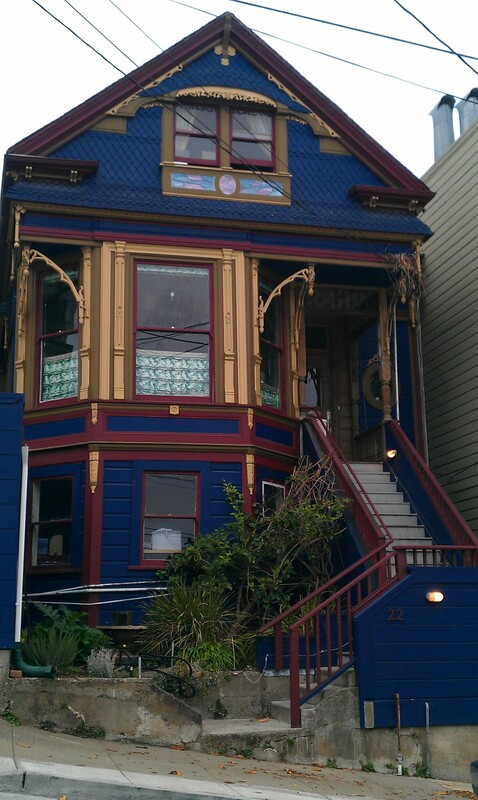 Or do you boldly go where no house has ever gone before? You could hire a color professional to help you decide or try my process of elimination which begins by tossing out all the colors you hate. If you decide to hire a professional, it’s vital you have an honest relationship with that person so you can feel comfortable about disagreeing with their proposal. Be sure you review their portfolio before signing on. 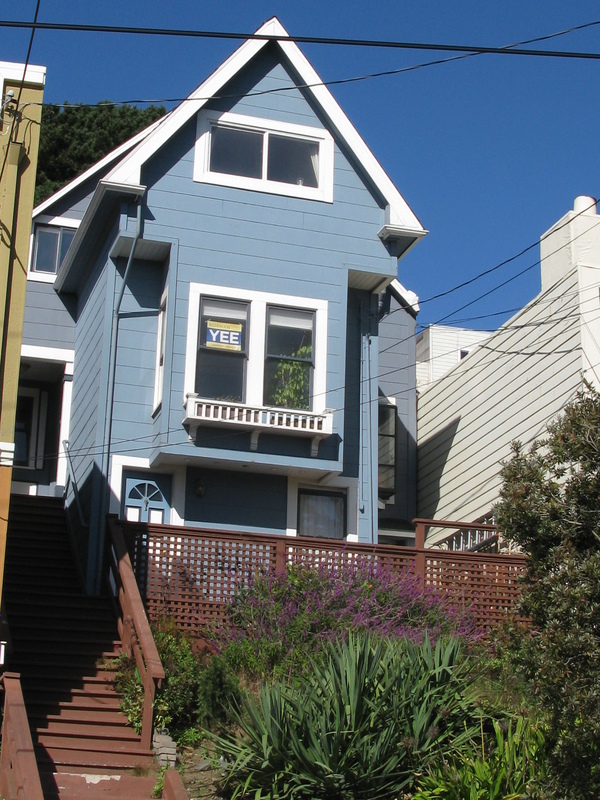 Remember it’s you who is going to be living with those color choices and painting a house can be a very expensive proposition especially if it involves scaffolding. The reason I stopped watching home design programs on TV was because I couldn’t understand why any designer would want the homeowner to go away and not participate in creating their own home environment. I just didn’t make any sense, feng shui and otherwise, to have a total stranger, albeit a designer, come into the home and do as they wished and afterward, invite the owners, who are blindfolded, come into their house and be completely surprised by the changes that had taken place. It freaks me out a little bit just thinking about it because I can’t imagine a better recipe for disaster. Sure it’s a whole lot easier for the designer to do whatever they want in someone else’s house, but for the people who live there, I can’t think of anything worse because everyone is different. That’s our strength, that’s why the world is full of all kinds of different people. What one designer likes is going to make one homemaker nuts. Just because something is new and shiny doesn’t mean its going to work and make you feel comfortable having it in your house. People have to play a role in deciding how their home gets decorated if they are going to live well and happy inside. I remember watching one design make-over episode where the designer installed a state of the art light fixture that called so much attention to itself that if it were in my house, I know I would’ve hated it and immediately have it removed. It’s crazy not to get involved in the design process. Granted the choices can be overwhelming so start simply with what you hate, come up with a budget and stick to it then limit your choices by store or material or color. Just keep widdling down the choices and you’ll discover you can make the right design decision that’s perfect for you. When my husband and I were looking to paint our house, one technique I came up with was taking high contrast, black and white pictures of my house, printing them out, and coloring them with colored pencils. I played around with differnt color options on different areas of my house so I could see how the same colors would work in the entryway or outside the in-law apt. we have. Then I taped my ideas on the cupboards in my kitchen so everyone could have a look and weigh in on the decision. 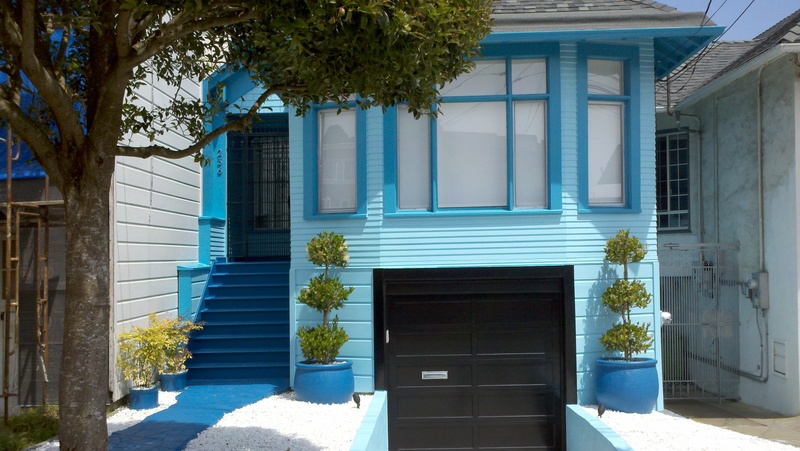 It took a while but by seeing the different options, I decided I wanted to paint my house blue. Once I picked my colors (six total including two for the stairs that were so alike you couldn’t tell they were different) I made a color map for my painters and I to refer to once the job got started. With a house like mine and with so many different shade of blue, I didn’t want to forget which color was supposed to go where. If you’re good at photoshop, you can easily drop a picture of your home into the program and start playing around with the colors. Have fun with the process, discover something new about yourself. Paint some swatches outside and then choose. A bold color might not be right for you and that’s fine, they’re not for everyone. Pick a color you not only can live with but one that will make you smile every time you see it. I can guarantee one thing, it’s a lot more fun and predictable than trying to place my photographs into this blog! NOTE: I just noticed that WordPress has taken the opportunity to create links in my posts that lead to companies selling items related to the topics I’ve presented. I have not authorized WordPress to do this, they have not asked for my permission to do this, I in no way support, recommend or have any relationship with the companies linked to my post nor do I benefit in any way, shape or form from these unauthorized links.